It is a marketplace for car rental operators and hirers. Hirers can rent the car both leisure and commercial usage on hourly or daily basis. How is Tribecar different from other car sharing? Tribecar is the only car-sharing model in Singapore equipped with the private hire insurance and complied with LTA regulation, allowing commercial (driving for Uber/GrabCar or sending delivery for NinjaVan) and/or leisure usages. What are the main benefits of using Tribecar? You can use it for commercial usage (Uber/GrabCar/NinjaVan) to earn money. Save the hassle of documentation and key exchanging at traditional car rental companies. Pay only what you need with our hourly or daily rental rates. Tribecar is conveniently parked within minutes from the MRT. Our rental rates are very affordable and starts from as little as S$2.00 per hour and from as little as S$65 per day (24-hours usage). It is not restricted by the business opening hour and you can collect the car anytime of the day. Is Tribecar better than owning a car? Tribecar is for the occasional use when the need arises. We give you the flexibility of using a car whenever you need one but taking care of all other costs. What can I use the car for? It could be for leisure activities from fetching your kids to school, buying groceries, running errands, Valentine Day, going for dates, a spin around Singapore, any recreational activities to commercial use for Uber/GrabCar/NinjaVan and much more. What are the requirements to join Tribecar? Be a Singaporean/PR who possess a valid Singapore driving license with 2 years of local driving experience (as indicated on your Singapore driving licence) or holding an employment with valid Singapore Driving License of at least 2 years. New Drivers that is less than 23 years old and old have less than 2 years local driving experience may also apply but they would be subjected to additional requirements. See Terms and Conditions for more information. How can I join Tribecar? Click on this link to sign up online, no membership fees required! If you have questions, please talk to our online team Fri - Tue 3pm - 12mn SGT (excluding PH). They can activate your account online! We highly recommend no walk-ins, very often we are out of office for deloyment. What if I don't have a credit/debit card? If you do not have a credit/debit card, an amount of S$500.00/- will be collected in cash for security deposit. However, you are require to have a credit/debit card for online top up. There will be a refundable security deposit collected per person at S$100/- (Singaporean/PR with local driving licence) or S$1000/- (Foreigners with local or international driving license) deducted through credit/debit card when you register online. An additional S$100/- security deposit applies for New Drivers. Rental is chargeable at hourly rate. Unlike other car sharing, we do not collect membership fee. The security deposit will be refunded back to you only upon termination of membership. Can I add named driver to my reservation? Yes, you can add up to two named driver, chargeable at 10% for current member and 30% for non-member per booking whichever that is higher. The non-member must also fulfill the requirements (in terms of eligibility such as driving experience, age and possession of valid driving licence (vocational licence too if required). My friend is also a member with Tribecar. Can he drive when the reservation is made under my account? Please add named driver (up to a maximum of two drivers) when making a booking. Are there any contractual terms I should be aware of as member with Tribecar? All hirers have to agree to our terms and conditions prior to signing up. The terms and conditions are subject to changes. Please click https://www.tribecar.com/terms for the latest copy. What happens to the log card and insurance if I were to drive for Uber/Grab? Once you completed your booking, we will assist to send the insurance and logcard to Uber/Grab. It is the responsibility of the hirer to get registered for Uber/GrabCar. In normal circumstances, it will take 1 working day to process. Please book in advance especially if you intend to use the car for income on weekend and PH. Click here for more FAQs if you wish to use Tribecar to drive for Uber/Grab. Account activation may take up to 1 - 2 working days. If you have waited for 2 business days and have yet to receive an SMS/email from us on the activation of your account, do let us know via email ([email protected]). Alternatively, use our Signup Online Chat that is open every week on Friday to Tuesday, 3PM to 12MN (SGT) (exclude PH) for registration assistance. My account is disabled, what can I do? We are sorry but your account may take about 1 - 2 working days to activate. Please use our Signup Online Chat that is open every week on Friday to Tuesday, 3PM to 12MN (SGT) (exclude Public Holiday) to talk to us. The chat is at the orange popup at the lower right hand corner of your screen. Alternatively, out of Signup Online Chat hours, please email ([email protected]) for assistance. To reset your password, simply proceed to the Login webpage and click on "I Forgot My Password". Click on the reset web link provided via email and you will be able to change your password accordingly. Only your contact number and email address can be updated by simply logging in to your account and clicking on "Edit Profile". If you wish to change other information (eg. Residential address) linked to your account, do write in to us at [email protected] for assistance. How do I reserve with Tribecar? You can reserve a car at www.tribecar.com after registration. How long in advance must I book a car? You can book a car up to 4 weeks in advance or you can make an on-the-spot booking and collect the car immediately. Can I pick up the car earlier? If there is no booking on the vehicle you book for the previous hour, you can pick up the car 30 minutes earlier. Just refresh the Account page 30 minutes before your pickup time to check if you are eligible. There will be a prompt message: "Car is available for early pick-up"
How short can I book a car for? The minimum reservation length for any booking is an hour. When is a car going to be at my neighborhood? If we have more than 10 members in the neighborhood, we will setup a pick-up location there. What is "Car Availablity"? How do I make use of it? 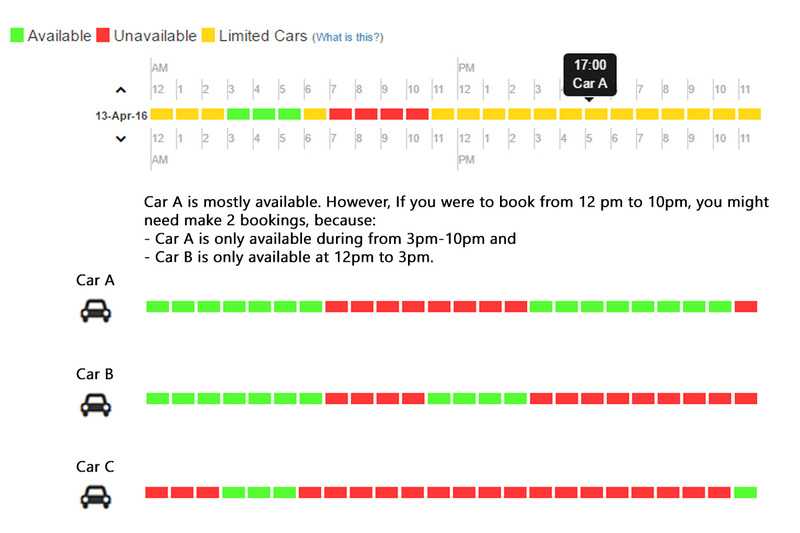 Car Availability displays the category availability for the days selected. To make use of it, users would need to understand the meaning of the colors. All Cars are available at this time slot. No Cars are available at this time slot. Some cars are available at this time slot. The schedule will not be displayed as the time has past, or this category is no longer available. When Limited Cars are displayed, hover your mouse pointer over the time slots to see which car is available during that time. Though the system will assign the car to you, it would be useful to understand which cars are available. When cars are limited, there is a small chance that the system is unable to assign you as single car at the time that you need it. An example of such a scenario shown below:. What is this $200 (Malaysia Usage) / $200 (Premium Cars) authorisation hold? If you book any cars in any of the Premium categories (e.g. for Audi A3), or if you make a booking for Malaysia use, you may be requested to approve an authorisation hold by Tribecar for the length of the booking or for at least 7 days. If you use a credit card, this reduces your available balance but do not appear as a charge on your statement. This is similar to how you place a authorisation hold on your credit card when you check into an hotel. If your booking extends beyond 7 days, you may be requested to re-approve this authorisation. If there are any damages or accidents or fines or any other charges incurred by you to due from you, we will capture this charge to offset any outstanding balance due from you. Otherwise, this authorisation will be cancelled automatically. If you are unable to complete the authorisation hold, there will be no refund or partial refund for the booking. This is so even if the booking was utilized partially or not utilised at all. What is the time frame for me to make changes to my booking? Amendments to bookings are not allowed. If you need to amend your booking, please cancel and make a new booking. The cancellation policy can be found here. I wish to extend my reservation. How can I do it? Click on the extend button and indicate the number of hours you would like to extend, there will be a message to tell you if it is successful. If you try to extend for 3 hours and it is unsuccessful, please reduce the number of hours for extension and try again. If you would like to make an extension during your trip, do note that no extension is allowed 15 minutes prior to reservation end time. What is the amendment / cancellation policy? Amendment / Cancellation less than or before 24 hours will incur full rental charge. Amendment / Cancellation equal or between 24 to 48 hours will incur half rental charge. Amendment / Cancellation more than or after 48 hours will incur $0.80 cancellation charge. In the unlikely event of breakdown before your collection, a full refund will be given to you. In the unlikely event of breakdown during your reservation, the remaining hours will be refunded as credits to your account. Please write to us at [email protected]. We will reply with a termination form. Please do fill it and mail the form back to us and we will process your termination. Do note that credits are non-refundable and please use up your credits in your e-wallet before termination. For information on the refunds of security deposit, click here. How long will the refund of the security deposit take? It may take up to 45 working days to process for the termination and your security deposit will be refunded back to you in a cheque. The reason for 45 working days is that we will need to check for any fines, penalty, foreign summons, insurance and court case before finance will be able to close the account. What happens if I am late for my booking or if I did not turn up? Charges will begin from the time you made your reservation, regardless of the usage of the car. What are the charges for returning the car late? How much does it cost to rent for an hour? Please refer to the rates table here. What does the payment consists of? Are there any hidden charges? We dislike hidden cost as much as you do. So what you see, is all that you need to pay. Prices are for rental on a pay-as-you-use basis. It does not cover incidental expenses such as parking, ERP and fuel. What does your e-wallet consists of? There are two components in your e-wallet - the amount that you top up as cash and the amount that is given to you in credits. Do note that credits will not be refunded back to you upon termination and you can use up all your credits before termination. How and when will payment be deducted? Once you made a reservation, credits will be deducted upon the confirmation of the booking. Is there a minimum credit I need to have in my account? You do not need minimum credit into your e-wallet but it is advisable to have at least S$20.00/- in your e-wallet just in case of late charges. If your e-wallet runs into negative balance, your future bookings will ALL be cancelled. My account runs into negative balance. What will happen? If your accounts run into negative balance, all future bookings will be cancelled and the amount for your future bookings goes back to your credit account. You will have to remake the booking again. You will have 24 hours to top-up your account in order not to have your account suspended. After which, you will have to remake the booking again. How do I top up my e-wallet and is there an expiry date for my credits? You may top up your e-wallet through the online credit/debit card top up system. Do note that a Payment Gateway Fee of between $1 - $3 will be chargeable for top-ups up to $200. Should you top up a custom amount (more than $200), there will be an additional $1 Payment Gateway Fee imposed per $100 increments. E.g. if you topup $300, you will incur a total of $4 in Payment Gateway Fees. While your membership is active, the credits in your account do not expire. However, do note that dormancy fee of $5 per month will be chargeable if the account remains inactive for 6 months. I think there is something wrong with my credit balance. What can I do? Email us at [email protected]. We will look into the matter and we will revert back to you. You can also check your own transaction after you log into your account. Can I exchange credit for cash or transfer it to my friend? The credit can only be spent on trips are not refundable for cash. You are also unable to transfer credit to your friends. Email us at [email protected] We will look into the matter and we will revert back to you. You can also check your own transaction after you log into your account via your e-wallet section. Where can I locate the car? You can refer to your booking details after you login. A map with the details to the location can be found on your account page. How do I unlock the car? The "Start Trip" is only enabled on the start time of your booking. Click on the "Start Trip" button, a blue lamp above the driver door handle will blink when the door is unlocked. Your trip will start based on the timing you booked. The car key will be located in the glove compartment to the left of the steering wheel. Please remember to return the key to the key compartment at the end of the trip. If you fail to do so, a key recovery service fee of $50 will be charged to your account. What if the car is damaged? There is a checklist located in your glove compartment. Go through the exterior of the car and checked against the dents, scratches or other damages. If anything is different, please report it by email: [email protected]. Please provide us with as much details as possible. You do not want to be held responsible for any damage you did not cause, so remember to check at the start of every reservation. No, you have to return the car to the exact parking lot where you took it. If I get down from the car during my reservation, do I use my phone to lock the car? No, you only use the unlock/lock car button from your phone during the start/end of your reservation. You can use the car key to unlock/lock the car during the reservation whenever you need to get down. Where can I park the car after my reservation? Please return the car back to the same parking location where you pickup the vehicle. If you are unable to park your car within the range of carpark lot numbers, report issue to let us know which Deck/Lot you have parked at. Note that your trip is only successfully completed after you click on end trip. Do arrive 10 minutes before your booking end to end trip or else cancellation charge will apply. How can I end my reservation? After you park the car, collect your belongings, remove any trash and tap the "End Trip" button. A blue lamp beside the steering wheel will light up after the door is locked. Do note that the reservation is only ended until you successfully locked the door and the page displays the message "Your reservation has ended. Thank you for using Tribecar". If you receive an error message, please try to "End Trip" two more times. Otherwise, email us immediately with the issue and you may leave the car. Please arrive 10 minutes before the end of your trip at the parking location so you may have enough time to tidy the car for the next customer. Please remember to return the key to the key compartment. So that you are able to "End Trip". For safety reasons, you must unbuckle all seat belts before ending the trip. I got an ERP fine/parking ticket. What should I do? Please make payment within the next 05 working days at any AXS station or at onepay.onemotoring.com.sg. If not, we will send your particulars to the relevant authorities and they will send you a fine notice separately and charge an administration fee of S$10 from your e-wallet. (w.e.f 1 Jan 2017). Are pets allowed in the cars? We strictly do not allow pets in the cars to be considerate to the next user that might be allergic to pets. You will be fined S$200 if there are fur found in the car. Smoking is strictly not allowed, even with the windows wound down. Customers caught smoking will be fined at S$200. Holding a cigarette outside the car while driving is still considered smoking as well. You will have to top up fuel for your drive and return fuel at any level so long as the fuel light does not comes up. If the next hirer report that the fuel light comes up; we will deduct $20 to $50 from your account. Hirer collecting the car has to take picture of the fuel light UPON IGNITION to show the picture of the fuel light and report issue within 15 minutes of reservation. IMPORTANT: As per of a trial, all Tribecar Opel Mokka (under Standard SUV) must be filled up to FULL TANK (Diesel Euro5 or better) when Ending Trip. Similarly, all Toyota Prius (under Standard Sedan Hybrid) must be filled up to FULL TANK (Petrol RON 95 or better) when Ending Trip. If you return the car with less than Full Tank, you will be levied $20 in fuel fees per 1/8th of the tank or part thereof. The subsequent hirer will be reimbursed 50% of the fuel fees successful collected. Do I need to do car wash? The car is dirty so can I send it for car wash? No need, we have engaged a vendor to clean our cars. If the car is too dirty (example: too much mud stains or vomit in the car seats), please send pictures to [email protected] and we will response as soon as we can and take necessary actions. Where can I park the vehicle during the course of my booking? You can park your vehicle anywhere but all parking cost will be borne by you. Are they are any tips for driving? For cars with Foot Parking Brake, e.g. Toyota Wish, be sure it is released before driving off. For cars with Foot Parking Brakes, you should see 3 pedals below the dashboard. Usually the left most pedal is the parking brake. For e-Start cars (aka Keyless Start), be sure to put the gear into Park, depress the pedal AND press the Start/Stop button to start the car. If the remote battery is weak, put the car remote on top of the Start/Stop button before pressing the Start/Stop button. Are there any regulations with regards to the use of the 10 foot lorry/commercial vehicle? As per HDB parking rules, you must NOT drive the lorry with cargo into the Multi-Storey Car Park (MSCP) as the maximum allowed ladened weight is 2,000 KG. The lorry itself is weighs close to that limit. Who takes cares of the car maintenance? The maintenance of the vehicle will be borne by Tribecar, Hirer must keep note of the vehicle engine temperature, any overheating due to Hirer's/Hirer's negligence, repair and any miscellaneous cost shall be borne by the Hirer. If there is any problem due to wear and tear or vehicle breakdown, the Hirer is to report to Tribecar immediately and seek for advice/permission before proceed to fix the issue. I left something behind in the car/I forgot to switch off the headlight. What should I do? Please make a separate booking for an hour to retrieve the item or switch off the headlight. Write to us at [email protected] and we will refund the booking. However, if you did drive during the booking, we are unable to reimburse you. Alternatively, if you see the next hirer, please seek for his/her assistance. The vehicle is covered with comprehensive motor insurance in place for all the vehicles. Own damage excess per accident from S$3000 & 3rd party excess per accident from S$3000 (Subject to GST of 7%). Kindly note that insurance coverage only covers the body work of the car and downtime for the rental period has to be charged separately depending on the duration of repair required. What is Collision Damage Waiver and what it does? Collision Damage Waiver (CDW) reduces insurance excess, both own damage and third party damage by 50% waiver in the event of any accident. Hirer can opt in for CDW by paying additional 6 to 10% of total rental, depending on vehicle type. Note: CDW is only applicable to selected vehicles under Economy Car/Economy MPV. * Above quoted amounts are subjected to GST charges. I got into an accident. What should I do and what should I note? If the car is in working condition, please drive to the workshop during office hours. If the car is unable to move, please press the button on your phone that indicates "breakdown" if your car is unable to move. We will activate tow service. If you get into an accident, you will also be obligated to report to the workshop (51 Paya Ubi Industrial Park #03-30 S408933) the next day for an accident report. Please take pictures of all the damage and scene of the insurance for claim that might be filed. Get independent witness (bystanders), ask for their contact and get them to write down what they saw. Take note if any party apologizes or accepts responsibility and notify us of the information. Please also be reminded to click on "End Trip" button. Keep calm. Login to Tribecar and navigate to your account page.Then, tap on the "Need Help" button to contact our 24-hour assistance service. You may wish to know that no replacement car will be provided for your booking(s). I got a punctured tire/flat battery/breakdown. What should I do? Please tap the Breakdown button in your accounts page to contact us. If there is a punctured tire, please change it yourself and send the car to the workshop to change the tire. An administrative fee of S$50 will be charged for on-road assistance on top of repair or replacement of car part to be charged to the customer. If it is due to wear and tear, charges will be borne by us. I press on "Start Trip" but the car door did not unlock? What should I do? If it is during office hours, please press on breakdown button and our operator will be able to assist you. If you are unable to reach us after office hours, please "End Trip" immediately and book at another location, write in to us at [email protected] and we will refund you the amount. I press on "End Trip" button. The car is locked but the page displays an error message. What should I do? If the car is physically locked, find somewhere with better reception and refresh the page first. You will be able to check that you have successfully ended the trip. What happens if I have a back-to-back booking? If the car-plate is the same, you can continue your booking and end trip when your second booking ended. If the car-plate is different, you will have to return the car back to your original location to swap the vehicle. You can check if the car plate is the same under your "Bookings" tab. What are the requirements for driving the car into Malaysia? Hirer will have to authorize a credit/debit authorization hold of $200 to start trip. Can all the cars be driven to Malaysia? Most of the Economy Sedan, Economy MPV, and Economy+ Sedans are allowed into Malaysia. The system will let you know if you can drive the car into Malaysia by providing you an option to select Malaysia Entry. What happens if the car experiences a breakdown in Malaysia? Hirer will be responsible for any towing fee up to the causeway. Hirer is also allowed to send the car for simple repairs for battery, tyres, air conditioning system. All costs and expenses arising from the breakdown of the vehicle such as towing fee, loss/damage reparation costs will be borne by the Hirer and no reimbursement will be given. What happens if you get into an accident in Malaysia? Insurance excess will be doubled at for own damage excess per accident & doubled for 3rd party excess per accident. Compulsory CDW will reduce hirer excess for own damage per accident & 3rd party excess per accident. See Terms and Conditions for more information. Hirer will have to make arrangement for tow up to the mid bridge of the causeway if the car is not adequate to drive. Hirer will also not abandon the Vehicle without any adequate provision for safeguarding. Hirer must also sought prior approval by Tribecar to leave the car. What happens if the vehicle is stolen/lost in Malaysia? Hirer will have to make a police report and inform Tribecar by press on the "Breakdown" button under "Need Help" on their booking page immediately. What are the things to note if I am driving to Malaysia? No extension allowed and late return charges apply. We are afraid that we do not provide child seats. What can I contact if I need to enquire? Please email us at our hotline: [email protected] and we will get back to you within 3 working days. What are the penalty charges do I need to know about? Subletting Rental/Sharing of Account/Unauthorized Sharing of Vehicle S$500 and the immediate forfeiture of the security deposit and termination of the registered member's account. Amount may be higher depending on the severity of the situation. Who can book a motorcycle? You must have the relevant riding class of licence, be 23 years old or older and have 2 years of riding experience. See terms and conditions for more information. What is different from the usual Tribecar rentals? You must return the motorcycle with a full tank of petrol. Can I use it for commercial purposes? E.g. HonestBee/Deliveroo/NinjaVan/etc. YES. You are fully covered to use it for commercial businesses. No. Please bring along your own safety equipment. Can I ride it into Malaysia? Not right now. Insurance coverage is withheld and voided once the motorcycle enters Malaysia. Full 3rd party insurance coverage is provided. Hirer is fully liable for damages/replacement of the rented vehicle. Where can I read the latest T&Cs for this service? I want to use Grab app to earn extra cash. I want to use Tribecar vehicles for delivery jobs and earn money.